No kitchen should be without a walk-in pantry. We had a temporary pantry in our old extension, and this proved the benefits of storing stuff in shelves, rather than lost in the back of kitchen cupboards. So a pantry was a key element of the new house design. It ended up behind the rammed earth wall, conveniently off the entrance to the kitchen. We asked Ian Thomson to make the shelves, which are a simple construction out of kauri (the same as the kitchen benches and floors). A key element of the pantry is the cool cupboard. This is an idea that I stole from somewhere, but I forget where now. This is a win-win solution: the cupboard is much cooler without any active cooling or fans. And the fridge runs up to 30% more efficiently, due to the extra ventilation. That’s cooler than the ambient temperature outside, which is 18°C at the moment in our mild Sydney winter. Not bad! 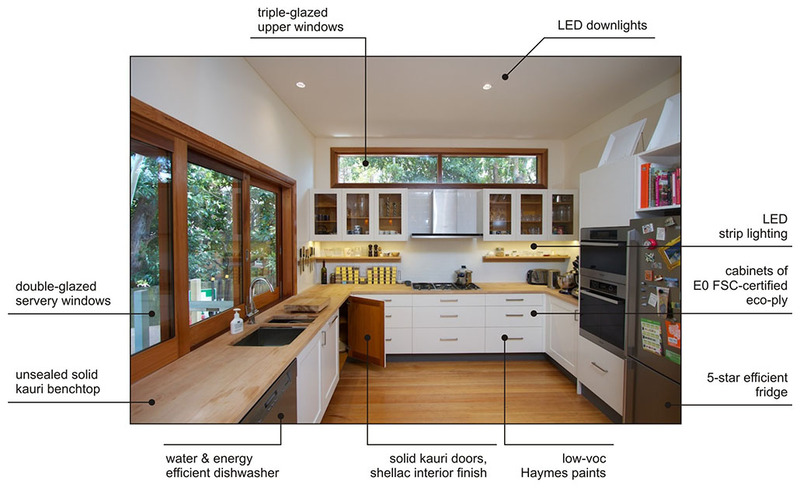 This entry was posted in Renovating the house, Saving the environment and tagged cool cupboard, fridge, kitchen, pantry, ventilation.